John William Coltrane, also known as "Trane" (September 23, 1926 – July 17, 1967), was an American jazz saxophonist and composer. 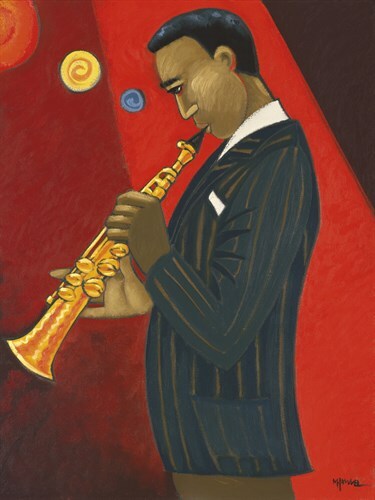 This painting depicts Trane in the mid-sixties with his tenor sax. Working in the bebop and hard bop idioms early in his career, Coltrane helped pioneer the use of modes in jazz and was later at the forefront of free jazz. He organized at least fifty recording sessions as a leader during his career, and appeared as a sideman on many other albums, notably with trumpeter Miles Davis and pianist Thelonious Monk. He was a somber, sober man who was very spiritual, almost prescient of his early death by liver cancer.